Pista House – a restaurant that has garnered fame globally for its haleem beckons you to indulge in the gooey goodness of this Nizami dish, all around the year. 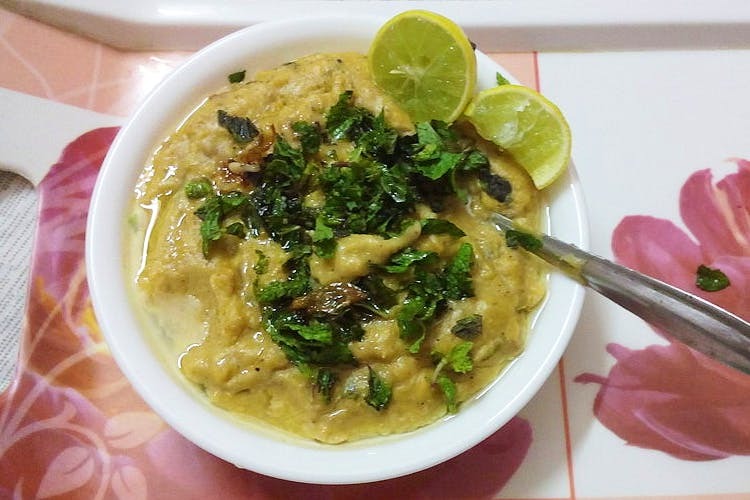 Serving haleem for 20 years, Pista House has received a cult-like following in Hyderabad and other cities as well. With over 5,000 outlets whipping haleem during the month of Ramadan, you might wonder what makes Pista House stand out. Taking the Hyderabadi haleem to Middle East, Europe, and the USA, it has even opened its outlets in the USA, New Zealand, Oman, and UAE. With over 10 outlets in the city alone, Pista House is an obvious choice for sourcing haleem for several corporate companies, family gatherings during Ramzan, etc. Cooked for nearly 12 hours in a bhatti (a cauldron covered with a brick and mud kiln) on a low flame of firewood, the preparation for haleem begins much before the dawn breaks. The dish includes minced meat (usually goat meat, beef or chicken), pounded wheat, ghee, dry fruits, spices, lentils and a lot of other things that result in the consistency. Garnished with fried onions, chopped coriander, and lime, this is worth going into a frenzy for. While the mutton haleem is the most popular at Pista House, it is also known for Badami Haleem that people take away in surplus amounts. Although the cafe is crowded, there is no snag in the service and we were served in a jiffy. On digging in, we could taste the tender meat, cashew nuts; the occasional flavour of ground pepper and crisp fried onions making it ambrosia worth not missing. We gobbled up our dishes within minutes and walked out making a mental note to come back for this experience. Pista House deliveries across the country and undertakes international orders too. Taking the Hyderabadi haleem to the Middle East, Europe, and the USA, it has even opened its outlets in the USA, New Zealand, Oman, and UAE. Well-packed in dabbas with tight lids, Pista House’s haleem travels to different parts of the world, wooing food lovers for all the right reasons.